Ross Guthrie is surrounded by East Fife defenders. League One opposition proved an obstacle too far for in-form Edinburgh City in last night’s William Hill Scottish Cup third round replay, as they went down 1-0 at home to East Fife. Chris Kane’s second-half strike was enough to end City’s eight-match unbeaten run, and send the New Bayview club through to a fourth round tie away to Livingston in the process. While Gary Jardine had admitted the league is City’s priority this term, going out of the cup at home is always a disappointment. “We looked flat,” he admitted. “We were disappointed with the way we played, but we were our usual selves. We worked really hard and competed well on a heavy park. There wasn’t a lot of good football and it was always going to be a scrappy goal that decided it and it was East Fife who got it, and they probably deserved it. City made six changes from the weekend win at Arbroath, perhaps with one eye on this weekend’s home clash with Stirling. Jardine’s team certainly didn’t start like a team that was more concerned with their league campaign, however. A strong early run from Ross Guthrie resulted in the ball eventually falling to Aaron Dunsmore, and the on-loan Hibs defender let fly from fully 30 yards, requiring Ryan Goodfellow to put strong wrists behind the ball. Opportunities were rare, but the visitors spurned the clearest one of the game on 25 minutes. Kevin Smith dug out a cross from the byline that took Andrew Stobie out of the game, although former Hearts midfielder Scott Robinson could only head over from close range. East Fife’s own Easter Road-loanee, Jamie Insall, did everything but score shortly before half-time, spinning and smashing the ball goal-wards from close range, only for Marc Laird to arrive just in time to block. Ross Allum then went close to marking his return to the starting line-up with a goal, lifting the ball over Goodfellow after Ian McFarland had put him through on goal, but Jason Kerr was alert enough to spot the danger and clear before the ball crossed the line. The League One side finally livened up a dull encounter by taking the lead ten minutes after the break. 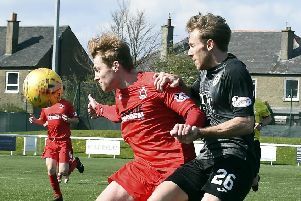 Scott Mercer’s corner was headed back in to the area by Scott Robinson, and with the City defence not able to get out at once, the midfielder’s former Hearts Under-19 team-mate Kane was left onside to hook past a static Stobie. The Fifers looked to have been denied a cast iron penalty soon after when Smith for all the world appeared to have been scythed down in the area. The majority in Meadowbank were awaiting David Lowe’s whistle and award, which bafflingly never came. City managed to force some slight pressure at the other end, but a low, trundling Dean Cummings free-kick that bounced harmlessly wide was all they had to show for it. Captain Dougie Gair was more threatening, his low drive requiring a smart stop from Goodfellow who tipped round the post. Edinburgh City: Stobie, Caddow, Dunsmore, Harrison, Laird, Muhsin (McConnell 72), McFarland (Cummings 72), Gair, Allum, Guthrie (See 72), Mbu. East Fife: Goodfellow, Mercer, Kane, Page, Kerr, Brown, Wilkie, Slattery, Robinson (Wallace 67), Insall (Austin 87), Smith.